Shazaaam! We’re playing Crashfest to celebrate 10 years of Chrash Landing Records in Zwolle tonight. It’s sure to be a blast to see old friends again – PARTY TIME! After that we will be working on new new releases, we’re planning a split 7″ and have been writing a bunch of songs for a full length too. A scoop: in March we’ll be playing Doomsday Celebration Fest in Leiden! We’ll be playing Heavy Hardrockin’ Friday. More info on that soonage! We played some nice shows this last couple of weeks. Simplon Groningen and Asgard Beverwijk with our brothers in Herder and Café Clouso Meppel last monday. 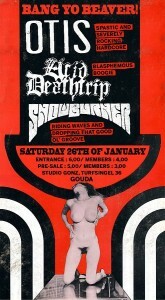 Next gig will be at De Gonz in Gouda with Otis and Acid Deathtrip. Come bang yo beaver! London was awesome! The gig was pretty cool, there was a nice mix of bands playing. X-Zone punk rock from Italy, Dumbjaw rocking it out and after us BLASTED shredded the venue to the ground! After the gig we had a nice hang out with Miles and Jo at the Dry Heave Records HQ, also our sleeping place for our stay in Camden. After a proper English breakfast we spend the next day record and nacho shopping. The evening started out with some pubbing at The World’s End before having the best Japanese meal ever. After some Camden Hells Lagers at the Black Heart it was time for hang outs and watching the hi-la-ri-ous R.Kelly’s Trapped In The Closet at our home away from home. Camden was awesome, thanks Miles and Jo! !